One of the more sought-after skills in culinary arts is how to cook ribs. It is definitely more of an art than a science, but the most important key to success is to cook the ribs as slow as possible. Cooking the meat too quickly will cause them to be tough and less flavorful. 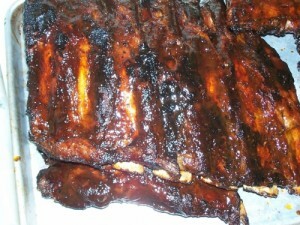 The ribs should be seasoned prior to cooking and may require additional seasoning throughout the cooking process. Common seasoning options are seasoned salt, pepper, and garlic powder. Other suggestions that will enhance the flavor of the meat are smoke flavoring and flavored wood. Ribs can either be cooked using a dry rub with the seasoning mentioned or any choice of barbeque sauce can be brushed on during the cooking process. You can cook your ribs using a grill, smoker, or simply a household oven. If using a grill, charcoal offers the better flavor and allows the meat to be cooked more slowly. Ribs should be cooked for approximately 30 minutes per pound and rotated every hour to ensure they don’t burn. keep the heat as low as possible and don’t place the meat directly over the heat source. Ideal cooking temperature on a grill is between 225-235 degrees. If cooking ribs in an oven, they should be cooked at 325-350 degrees. Again, ribs should be cooked for approximately 30 minutes per pound and rotated every hour. A rack of ribs will take 1-2 hours. The last 15-20 minutes of cooking you can increase the temperature to 375 to ensure they are thoroughly cooked. Ribs offer an excellent summertime dish paired with items such as corn on the cob, pasta salad, and cornbread. Red wine, beer, or a glass of iced tea will surely compliment the wonderful flavor of ribs.